The fruits that ripened from Tu BiShvat on were counted for the following year's tithes. The name Tu BiShvat is derived from the Hebrew date of the holiday, which occurs on the fifteenth day of Shevat. "Tu" stands for the Hebrew letters Tet and Vav, which together have the numerical value of 9 and 6, adding up to 15. Tu BiShvat is a relatively recent name; the date was originally called "Ḥamisha Asar BiShvat" (חמשה-עשר בשבט), which means "Fifteenth of Shevat", and many Haredi Jews prefer to use this original name. The first of Nisan is the "new year for kings and festivals". The first of Elul is the "new year for the tithe of cattle"; Rabbi Eleazar and Rabbi Shimon, however, place this on the first of Tishrei. The first of Tishrei is the "new year for years" (calculation of the calendar), "for release years" (sabbatical years), jubilees, planting, and for the tithe of vegetables. The first of Shevat is the "new year for trees" according to the school of Shammai; the school of Hillel, however, place this on the fifteenth of Shevat. Orlah refers to a biblical prohibition (Leviticus 19:23) on eating the fruit of trees produced during the first three years after they are planted. Neta Reva'i refers to the biblical commandment (Leviticus 19:24) to bring fourth-year fruit crops to Jerusalem as a tithe. Maaser Sheni was a tithe which was collected in Jerusalem and Maaser Ani was a tithe given to the poor (Deuteronomy 14:22–29) that were also calculated by whether the fruit ripened before or after Tu BiShvat. Of the talmudic requirements for fruit trees which used Tu BiShvat as the cut-off date in the Hebrew calendar for calculating the age of a fruit-bearing tree, Orlah remains to this day in essentially the same form it had in talmudic times. In the Orthodox Jewish world, these practices are still observed today as part of Halacha, Jewish law. Fruit that ripened on a three-year-old tree before Tu BiShvat is considered orlah and is forbidden to eat, while fruit ripening on or after Tu BiShvat of the tree's third year is permitted. In the 1st, 2nd, 4th and 5th years of the Shmita cycle Maaser Sheni is observed today by a ceremony redeeming tithing obligations with a coin; in the 3rd and 6th years, Maaser Ani is substituted, and no coin is needed for redeeming it. Tu BiShvat is the cut-off date for determining to which year the tithes belong. Tu BiShvat falls on the 15th day of the Hebrew month of Shevat and begins a three-month series of mid-month full moons that culminate in Passover. On Tu BiShvat 1890, Rabbi Ze'ev Yavetz, one of the founders of the Mizrachi movement, took his students to plant trees in the agricultural colony of Zichron Yaakov. This custom was adopted in 1908 by the Jewish Teachers Union and later by the Jewish National Fund (Keren HaKayemet L’Israel), established in 1901 to oversee land reclamation and afforestation of the Land of Israel. In the early 20th century, the Jewish National Fund devoted the day to planting eucalyptus trees to stop the plague of malaria in the Hula Valley; today the Fund schedules major tree-planting events in large forests every Tu BiShvat. Over a million Israelis take part in the Jewish National Fund's Tu BiShvat tree-planting activities. In keeping with the idea of Tu BiShvat marking the revival of nature, many of Israel's major institutions have chosen this day for their inauguration. The cornerstone-laying of the Hebrew University of Jerusalem took place on Tu BiShvat 1918; the Technion in Haifa, on Tu BiShvat 1925; and the Knesset, on Tu BiShvat 1949. As a modern-day nod to the medieval "feast of fruits" in 2019 the IDF purchased 10 tons of dried fruits to distribute to soldiers throughout Israel. The fruits purchased included 500 kg of almonds, 1 ton of peanuts, 2.2 tons of raisins, 500 kg of walnuts, 1500 kg of dried apricots, 500 kg of dried cranberries, and 1000 kg of banana chips. According to Israel's agricultural ministry, most dried fruit available in present-day Israel is imported from Turkey. Tu BiShvat is the Israeli Arbor Day, and it is often referred to by that name in international media. Ecological organizations in Israel and the diaspora have adopted the holiday to further environmental-awareness programs. On Israeli kibbutzim, Tu BiShvat is celebrated as an agricultural holiday. ^ a b c "Dates for Tu BiShvat". Hebcal.com by Danny Sadinoff and Michael J. Radwin (CC-BY-3.0). Retrieved August 26, 2018. ^ When representing the number using letters, rabbinic rules forbid using the letter-numerals that represent 10 (י Yud) and 5 (ה Hei) together because they form the abbreviation of the "ineffable name of God", YHVH יהוה. Therefore, the number 15 is represented by the letters ט (Tet) and ו (Vav), or 9 and 6 = 15. ^ "Translation:Talmud/Seder Moed/Tractate Rosh Hashanah/2a". Wikisource. December 14, 2015. Retrieved January 23, 2019. ^ "Tu Bishvat". Jafi.org.il. May 15, 2005. Archived from the original on January 14, 2005. Retrieved January 20, 2011. ^ Kariv, Gilad (January 21, 2008). "Tu Bishvat / The Festival of Love – the Celebration of Nature". Haaretz. Retrieved January 22, 2019. ^ "What is Orlah". Ask Moses. Retrieved January 20, 2011. ^ "With Light and With Might: Glossary". Sichosinenglish.org. Archived from the original on November 28, 2010. Retrieved January 20, 2011. ^ MOSHER, JAMES (January 20, 2010). "Tu B'Shevat celebration inspires rabbi's lecture series". Norwich Bulletin. Tu B'Shevat falls on the 15th day of the Hebrew month of Shevat and begins a three-month series of mid-month full moons that culminate in Passover. Purim occurs on the 14th of Adar (Feb. 28), the month after Shevat, and celebrates Jewish escape from a planned genocide in the Persian Empire. The Book of Esther is read on Purim and it foreshadows the rise and fall of Nazism. Passover is the festival of freedom and begins on the 15th of Nissan (March 30), the month following Adar. ^ "'A Thing or Tu 'bout Shvat'". Torah.org. Retrieved January 20, 2011. ^ "Zionist Philosophies". Mfa.gov.il. October 19, 1999. Retrieved January 20, 2011. ^ Zuroff, Rabbi Avraham (2011). "Just a Jewish Arbor Day?". Ohr Somayach International. Retrieved January 20, 2011. ^ a b Rinat, Zafrir (January 20, 2011). "Israelis Go Green For Tu Bishvat". Haaretz. Retrieved January 20, 2011. ^ Paz, Shelly (January 19, 2008). "Tu Bishvat gets 'shmita' treatment | Israel | Jerusalem Post". Fr.jpost.com. Archived from the original on July 13, 2011. Retrieved November 6, 2011. ^ "The Knesset's Early years". Knesset.gov.il. Retrieved January 20, 2011. ^ Yael Zisling (January 21, 2019). "IDF Distributes 10 Tons of Dried Fruits, Nuts to Soldiers for Holiday of Tu B'Shevat". Algemeiner. Retrieved January 22, 2019. ^ "Tu B'Shevat (Arbor Day) in United States". Operational Home Front. 2011. Archived from the original on April 28, 2012. Retrieved January 20, 2011. ^ "Arbor Day Around the World". Arbor Day Foundation. Retrieved January 20, 2011. ^ "Kibbutz Lotan – Tu B'shvat Campaign". Kibbutz Lotan. 2005. Archived from the original on July 13, 2011. Retrieved January 20, 2011. ^ "Tu B'Shvat – The Jewish Earth Day". Jewish Woman Magazine. Retrieved January 20, 2011. ^ Yael Zisling. "Tu Bishvat traditions". Gemsinisrael.com. Archived from the original on July 11, 2011. Retrieved January 20, 2011. 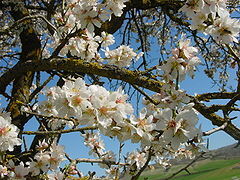 Wikimedia Commons has media related to Tu Bishvat.